Close up: Surface-shaded representation of ZIKV showing the capsule’s characteristic five-fold at the center. “Form follows function” is an oft-repeated cliche in biology—if you know how something looks, then perhaps you can figure out how it works. But inevitably, some of the most intricate, awe-inspiring forms will take on some of the most diabolical functions imaginable. Such is the case for the pandemic Zika virus that has terrorized the globe in the past few years. A cryo-EM reconstruction of the Zika virus showing the structure of its component proteins. The 2017 Nobel Prize in Chemistry went to three scientists, not for a specific discovery, but for advancing a technology called Cryo-Electron Microscopy, or cryo-EM. 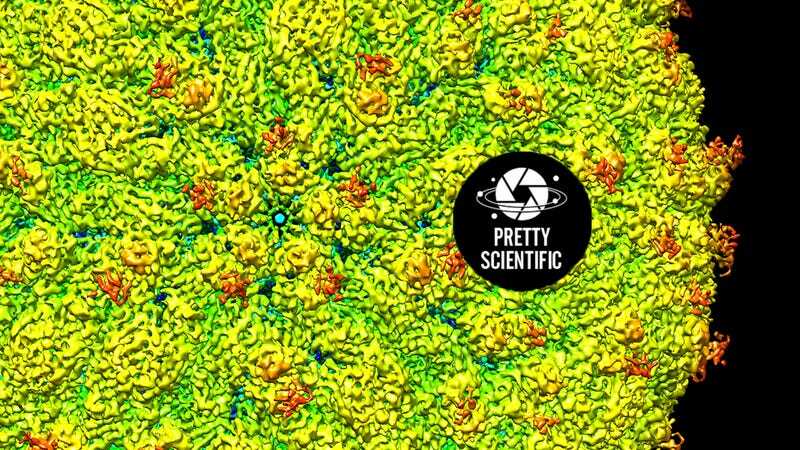 This method of freezing a sample to create accurate molecular images has revolutionized biologists’ understanding down to nearly atomic levels. A picture that perhaps best summarizes the technique’s power is of the Zika virus, imaged to resolution such that fine details of the virus could be appreciated during the height of the epidemic. When the Zika virus began to spread and with its link to microcephaly confirmed, scientists were flooded with questions. What about the structure caused the symptoms? How does it differ from other viruses in the same family, like dengue and West Nile? Competition ensued beginning in January 2016, as multiple labs worked quickly to publish the virus’ structure. Sirohi unveiled the results just three months later alongside the rest of her team: Zhenguo Chen, Lei Sun Thomas Klose, Michael Rossmann, and Richard Kuhn at Purdue, and Theodore Pierson at the NIH’s National Institute of Allergy and Infectious Diseases. Scientists have long used a method called x-ray crystallography to image viruses, in which x-rays are shot at a sample, whose structure is mapped by how the x-rays bounce off. The virus’ softer structure makes that method less than optimal. With cryo-EM, the researchers instead freeze the cells quickly onto a grid with liquid ethane, which doesn’t disrupt the structure as much. 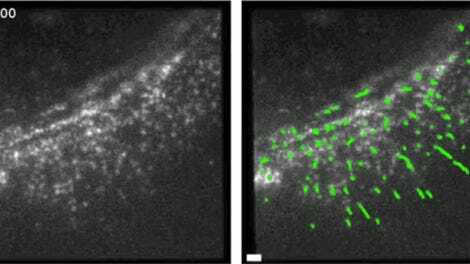 They then hit the cells with electrons, tiny subatomic particles, and use a detector to produce many two-dimensional projections of the virus. Reconstructing a 3D image from a bunch of 2D pictures isn’t an easy task. Once they had enough individual images, they combined them using several computer programs, incuding Relion and jspr, to analyze and build up the view, average the data over lots of images, and correct for relics that the microscope might have added. Each single image is noisy—the electrons are shot relatively lightly so as not to distort the sample. Every 2D image corresponds to a different orientation of the 3D Zika virus, rotated in space. Programs mathematically convert these images into abstracted, easier-to-manipulate shapes using something called a “Fourier transform.” Any pair of these 2D transformed images would then share a common line. Think about slices taken from a ball, one from a vertical cut and one from a horizontal cut. Each slice would look like a disk, and the two disks would intersect on a single line. The software can build up these lines based on certain prior assumptions and convert them back into the virus’ 3D figure. In this case, the building-up required the assumption that Zika would have icosahedral symmetry (in other words, be of a shape pretty typical of spherical viruses). Then there’s actually understanding the results. This requires even more analysis and several other programs, including Coot, Phenix, and CNS, to dig into the molecular components of the structure: the individual proteins and their amino acids. Different colors are applied to specific structures, typically proteins or domains of proteins (like those forming the virus’ capsule or membrane). All of this creates the intricate, three-dimensional, colorful image of the Zika virus, demonstrating how the components combine to form the capsule. Though cryo-EM has been around for a few decades, it’s only in the past five years that structures have been released with this much clarity. This is what Melissa Chambers, cryo-EM specialist at the Harvard Cryo-Electron Microscopy Center for Structural Biology, and others call “the resolution revolution.” Chambers pins the revolution on a combination of many factors, including enhanced electron detectors, better analysis software and algorithms, better freezing grids, and more precise tools and methods. The Zika paper is one of many, many new papers using cryo-EM to figure out the structure and function of life’s smallest pieces. A diagram showing the “resolution revolution” of cryo-EM. Sirohi and her group, as well as others, have since taken important strides in understanding the Zika virus, specifically about how antibodies combine with it so that the body’s immune system can attack and neutralize the threat. Perhaps antibodies could then be used to help treat the disease. Three images demonstrating structures gleaned through cryo-EM, including Zika virus on the right. Cryo-EM will continue to be an important resource for biologists hoping to understand the structure of the most important molecules that both cause and cure the problems we face as humans. But working on something as threatening and pressing as Zika has been particularly rewarding.